Rest and Service Areas or better known as the RSAs or R&R are well maintained facilities that provide traveller a stop point during their long distance trip. Located every 80 to 100 kilometers, these facilities are well maintained to ensure every highway user is made to feel as comfortable as possible to enjoy their journey. Our rest and service areas (RSAs) are continuously upgraded and improved upon, with particular focus on the hygiene and cleanliness of toilets and food stalls. 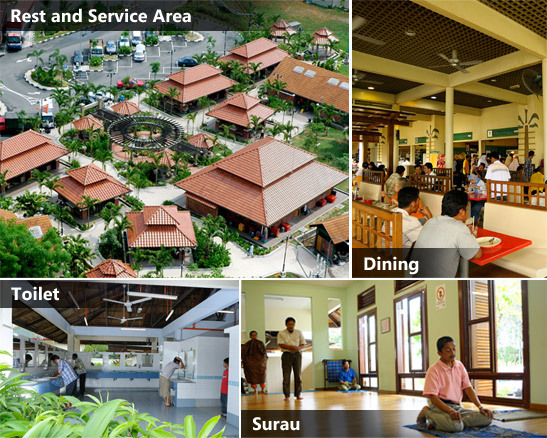 However, several of our facilities offer more than just a pit stop for the weary traveller. Some of the available amenities include children's playground, petrol stations, 'surau' or the prayer room for Muslims, auto-teller machines (ATM), wakaf (rest shelters), public telephones and air-conditioned restaurants. There are 24 RSAs on the PLUS Expressways.